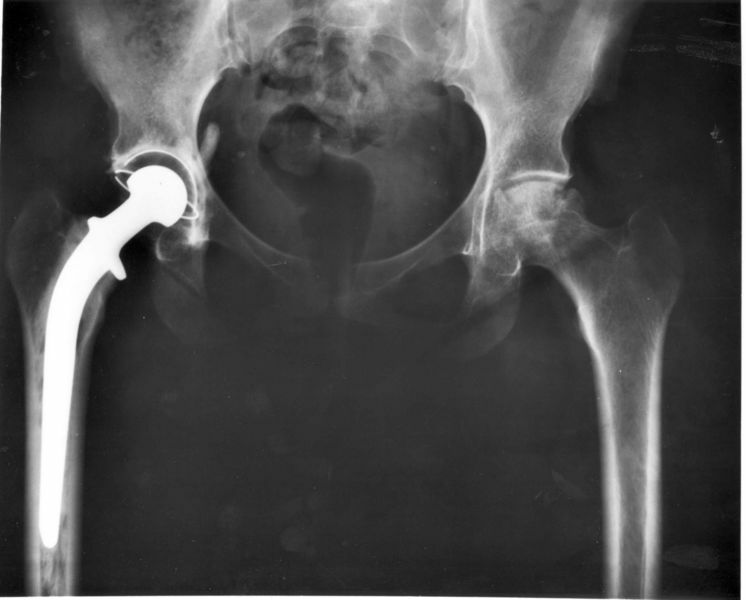 blog home Product Liability What Can Go Wrong With a Metal Hip Implant? Since the 1970s, the Federal Drug Administration has classified metal-on-metal implants as “high risk.” But through the premarket notification 510(k) process, in which any new device that is “substantially equivalent” to an existing device can be sold to the public without the FDA’s premarket approval, many metal-on-metal products made their way to consumers without adequate testing. The main risk they were speaking of is a dangerous health condition called metallosis. In exploring metallosis, we’re going to look at one particular product: the DePuy ASR XL Acetabular System. (DePuy Synthes, one of the largest device manufacturers in the U.S., is a subsidiary of Johnson & Johnson.) On the market since 2005 and voluntarily recalled in 2010, it is a good example of the underlying problem with metal-on-metal hip implants. The ASR XL Acetabular total hip replacement system consists of three parts: a ball, a stem, and a shell. The shell is what fits inside the hip socket (also called the acetabulum, and where the product gets its name). The stem is fixed inside the femur bone, and the ball is fixed at the top of the stem like the femoral head, fitting into the socket. This design is a departure from previous hip implants, which had four components: the ball, stem, shell, and a lining to cushion the ball from the shell. By getting rid of the lining, DePuy increased the femoral head’s surface area, which made the new hip less likely to dislocate. But it increased the friction between the ball and the shell, both made out of a cobalt-chrome-molybdenum. Every hip implant sheds debris into the body as the parts rub against each other, but both cobalt and chromium are heavy metals. The human body requires a small amount of heavy metals, but too much can be toxic and cause serious health problems. And that’s what ended up happening. When a metal socket grinds against a metal joint, tiny particulates of cobalt and chromium are physically released into the surrounding tissue and bloodstream. Too many metal particulates are toxic and cause the surrounding tissue to die, form pseudotumors, destroy the bone, and loosen the hip from its socket. All in all, thousands of patients required revision surgery due to metallosis, sometimes called adverse local tissue reaction (ALTR). Corrosion is an electrochemical reaction in which metal gives off ions, or charged atoms, as it seeks a more stable elemental form. It is another danger present with metal-on-metal hip implants, releasing a much smaller form of metal debris into the surrounding tissue and blood. Another danger metal-on-metal hip recipients face is heavy metal poisoning. Metallosis is a localized trauma. But when metal toxins travel through the bloodstream into other parts of the body, other organs can be infected—especially the brain. Too much chromium can cause respiratory problems, renal problems, and gastrointestinal problems. Cobalt poisoning can cause heart or kidney damage, nerve damage, thyroid damage, and more. Surgery is the only effective treatment for metallosis; the sooner the revision takes place, the better for the patient’s long-term health. Metallosis is “described as a rare diagnosis,” with 5% of patients suffering from it. However, DePuy admitted to a failure rate for its ASR XL that was much higher—13%. Some of these problems are related to metallosis in the tissues around your hip, but some of them are related to metal particles traveling to other parts of your body and disrupting their function. This is just as true in the United States. An estimated 93,000 ASR XL total hip replacement systems were sold by DePuy worldwide, many going to American patients. What Can I Do If I Have Symptoms of Metallosis? DePuy has manufactured more than one faulty hip replacement: the ASR, the ASR XL, the AML, the all-metal Pinnacle, the Prodigy, the S-ROM, and the Marathon. Several were recalled by the company, others retired, and DePuy ended up having to pay big bucks in court. In March 2016, a Texas jury awarded $502 million to five patients injured by DePuy’s metal-on-metal Pinnacle. Nine months later, another Texas jury awarded $1 billion to six patients. A third jury in November 2017 awarded $247 million to six more patients. And the lawsuits are far from over. Meanwhile, Johnson & Johnson paid out more than $4 billion in November 2013 to settle a number of lawsuits over the ASR. To date, there are around 12,000 more lawsuits pending in court. If your hip implant is causing you pain or you have symptoms of metallosis, please see your orthopedic doctor immediately. If you have questions about filing a lawsuit for compensation to pay for a revision surgery and other damages you suffered, please call Bottlinger Law L.L.C. Our product liability team has handled DePuy Pinnacle implant cases, and will be able to guide you in your claim. Contact us for a free case evaluation at (402) 505-8234.